It's usually the first thing to get canned on TLC's "What Not to Wear," but that ugly Christmas sweater has become quite the popular holiday item. Just ask those selling them online. Ugly Christmas sweater designs range from the subtle to the outrageous - there's even one portraying a recent meme of an officer pepper spraying protesters in California. On Nordstrom.com, one sweater goes for $600. Singer Justin Bieber reportedly wore a $1,650 red-and-white Christmas sweater during a live performance. The men behind UglyChristmasSweaterParty.com - Adam Paulson, Brian Miller and Kevin Wool,2004 and 2005 graduates of Indiana State University - started noticing an increase in ugly Christmas sweater parties in mid-2000. The parties are said to have started in 2001 in Vancouver, British Columbia. "From talking to people, I think the consensus is that the majority of people spend 364 days out of the year worrying about what they look like," Paulson told ABC News today. "[The sweater party] gives them one night to look totally stupid, to feel like they fit in, no matter what they wear. All inhibitions are gone." Miller bought the web domain name and started a blog to keep track of rising trends, for example, ugly Christmas sweaters. Then in 2009, after hearing that people were having a hard time finding ugly holiday sweaters, the three started an online business. They bought about 50 sweaters from a local Goodwill. Paulson said he thought he'd wasted $75. But by the next day, "they were all gone," he said. Nancy Schloetel of Mountlake Terrace, Wash., started her business Notyouraveragesweater.com during the 2010 holiday season. Schloetel said she got the sweaters from lots of different thrift stores. Although the 2010 season was quiet - she said people had trouble finding her online - this year business has been steady since early November. "All my best stuff has gone out the door," she told ABC News. "I've been shipping stuff out all night long." Schloetel said she had purchased about 360 sweaters this season and had sold half so far. Her sweaters range in price from $18 to $24, though some have gone for $40, if she makes a few design enhancements. She told ABC News that her customized sweaters have included battery-operated lights and even a sewn-on Nativity scene. "If they're too common, too normal, I try to do something to uglify them," she said, laughing. This year, the guys behind UglyChristmasSweaterParty.com said they have 15,000 sweaters, which they now buy from a "sweater guy." Their inventory has grown from filling the 600-square-foot floor of a loft to a basement to an entire leased warehouse. The sweaters go for $24. Charlene Sarmiento, a spokeswoman for Goodwill Industries International, said that she'd heard sweaters were going fast at the more than 2,600 Goodwill stores across the U.S. and Canada. "They are flying off the shelves. Lots of people are looking for those type of festive, holiday sweaters, and they are selling very well," she told ABC News. Anne Marie Blackman of Killington, Vt., started My Ugly Christmas Sweater in 2009. A former stay-at-home mom looking to make money, Blackman decided to embellish some sweaters that would definitely be contenders for most ugly at any holiday fete. She took her products to eBay and they sold. "I was shocked," she told ABC News today, "and I decided to make it a business." Blackman said that her site had 100,000 page views Wednesday and almost 5,000 hits on Facebook. This year she moved the sweaters from her home to a warehouse. Of the 2,500 sweaters - triple the number from last season - available for purchase, two-thirds have been sold, she said. Her sweaters range from $35 to $80 and sell all over the world. "It's a very easy, fun way to have a theme party," she said. 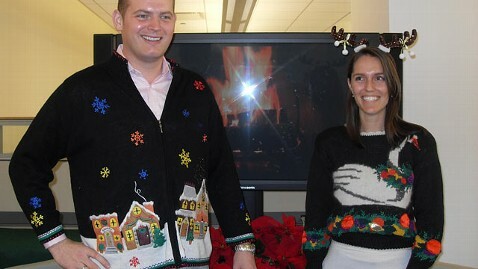 "It started out a young person's trend, people making fun of their mom and grandmom's sweaters. Now it's moved to those moms and grandmoms having their own parties." Miller, Paulson and Wool - who also have day jobs - released a book in November advising readers of what to wear if they're invited to an ugly Christmas sweater party, and how to throw one. Paulson said the last half of the book included "the ugly Christmas sweater Hall of Fame." Schloetel said that ugly Christmas sweaters were good conversation starters. "For one thing, everyone just looks so silly," she said. "You can't help but smile. You don't have to worry about getting dressed up or getting ready. The worse you look, the better. It puts a real fun atmosphere in place."